Howdy Folks! 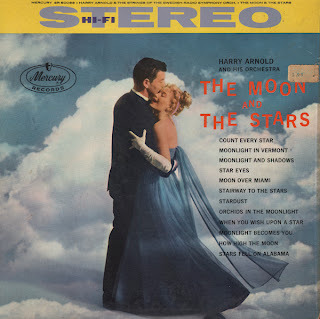 Check out my Atomic Age Vinyl Finds! If there are copyright issues or a problem with any post, just contact me and I will make corrections. I'm here to have fun and hope you will share in my process of discovery! Here is a sample from an obscure avant grade album I picked up today. Enjoy the sealed minty fresh goodness. The cover art is a reproduction of an engraving by Roger Vieillard titled "La Musique et la Danse". 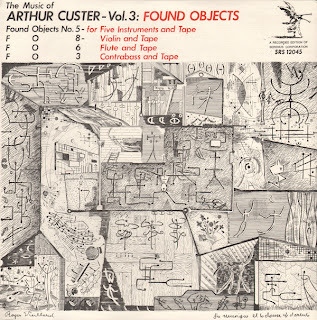 Link here for Arthur Custer's biography. 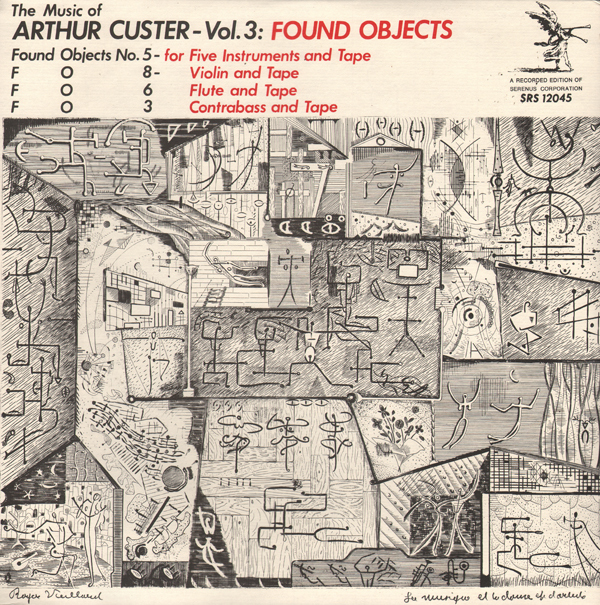 Excerpt from the back cover: Serenus asked me to provide some notes to accompany this recording of four of my "found objects" pieces, and as I undertake to express my thoughts I discovered that I have been hanging onto some ideas that I'd never put into words before, and that there were other subliminal thoughts of which I became conscious at the same time. – Found Objects No. 5: The second aspect has to do with the relationship of the performer to the audience. The performer is a "player" in the theatrical as well as the musical sense. Because "Sight Music" is for players (note the title) rather than the instrument, certain actions are called for which are at times primarily visual and therefore dramatic. It is a piece to see as well and hear, a piece to entertain, an "entertainment" whose purposeful irony derives from the confluence of serious intentions and playful results. 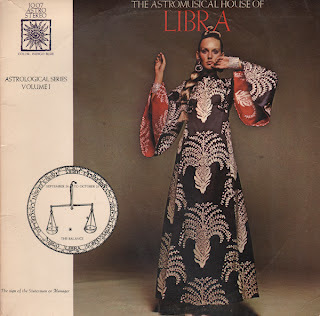 A series of mood/easy listening LPs featuring Astrological Signs as the conceptual theme which is supported graphically by the work of popular fashion designers who dress the women posed for the cover art. Arranging credits are not to be found on the material. Love Theme Form "elvira Madigan"
Love Theme From "Romeo And Juliet"
From Billboard, August 17, 1959: Delightfully orchestrated and performed mood music, with tunes keyed to stars, moon and the celestial scene. The Arnold group features strings and woodwinds in a slow, languorous beat, similar to that heard on earlier Jackie Gleason albums. Attractive listening, well recorded with the only drawback being the lack of name power in the overly competitive mood field. Yes, when I listened to this album, I also thought of Gleason's work in that the album features a "concept"which Gleason was so good at creating and above average arrangements. My blogs are all about sharing obscure and sometimes odd recordings. My three blogs feature introductions to vintage & unique gospel recordings, atomic age pop and lounge/strange music. My gospel blog, The Good, Bad & Ugly Gospel Record Barn focuses on Cincinnati, Ohio and Northern Kentucky area artists who recorded on local labels such as Jewel, Rite and Queen City Album. In general, I will be posting only samples and not entire albums. If I post only an album cover it is because the content is available on CD or by download. If an artist is still working, I will usually refrain from posting a sample. I do my best to locate information on the artist. I realize relatives and friends may find posts of people they knew or know. I hope you will be pleased with what you read. The worst fate for an artist, I believe, is to be completely forgotten. I do not blog many of the albums I find because the recordings fail to share a personal vision or a special energy. Liking or disregarding art is relative to your experience, but I think that it is better to be remembered for something crazy, than for nothing at all. The Keyboard Sounds Of Today!